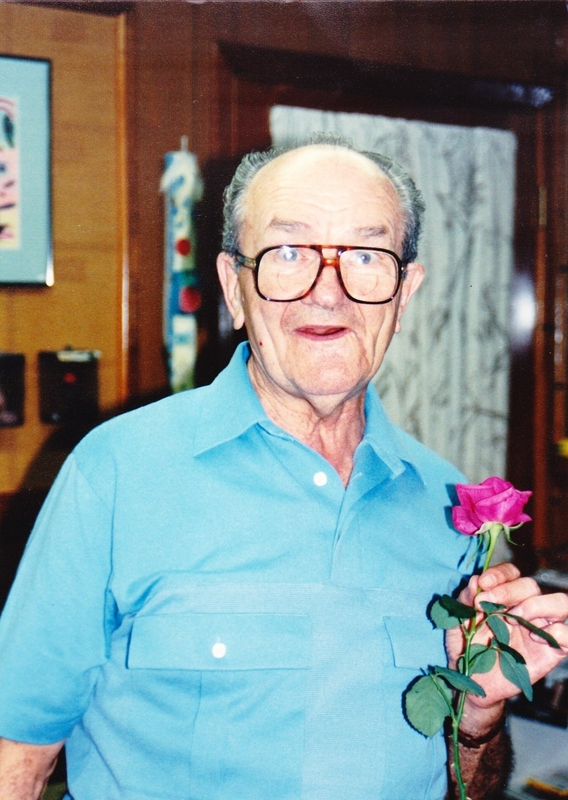 My father, Ed, and endearingly known as Magoo in this story. Well, fast forward to the nineties, and envision Mr. Magoo driving a huge handicap accessible van with me as his passenger. Yep, my father brought this cartoon codger to life. But, instead of those he encountered on the road shouting “choice words,” my Magoo would receive the ultimate symbol of road rage ~ the finger! With his eyes straight forward, and his ever present angelic smile on his face, my dad was oblivious to “the bird” without song. When we would return from an outing, my mother would roll her eyes and question. Depending on the number that I would disclose, her response would be different. “Good God! When will he realize that he needs to turn in his keys. One might ask at this point, why I chose to throw the dice and ride with him? Well, I knew that Mr. Magoo was very lucky, but my father carried a plantimun membership card that entitled him to ~ divine protection. I say this in truth, awe, and honesty. I truly was convinced of some sort of sacred shield that surrounded this tranquil compassionate man. No matter what the situation, I never road in fear. For five years in the nineties, my Magoo escorted me to a gym three times a week in Daytona. 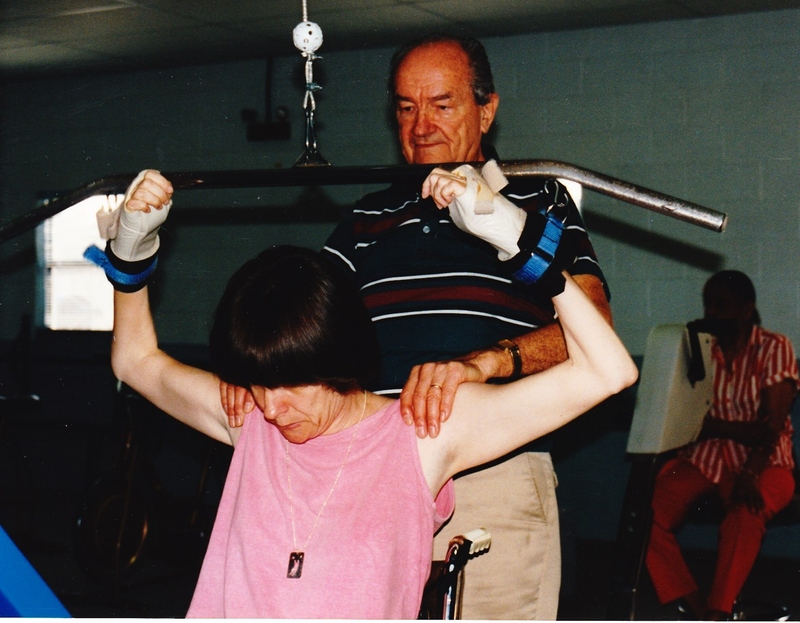 The workout equipment was geared for those with spinal injury, and those who had suffered from strokes. Our eclectic group along with the therapist, Jeff, could be likened to a can of mixed nuts. We were all quite different, but those differences produced a variety of perspectives that made for interesting conversations, and plenty of laughs. Many were from “the greatest generation.” They knew of hard work, loyalty, giving and friendship. Each story they told was a triumph over great odds, and their inner compass was set on living life to the fullest. There was no lack of inspiration in this room ~ ever. 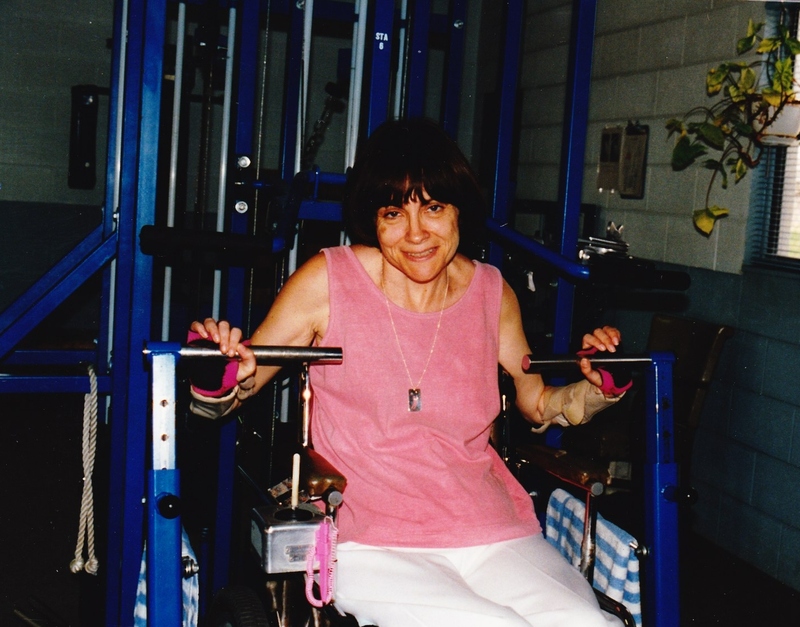 Anita working out on one of the weight machines. Imagine the stories being told in this gym filled with laughter. This story really begins on our way to the gym one morning. As usual my father came to pick me up around 9:00 am ~ always prompt, always cheerful. After the lift hoisted me into the van, I was locked in behind the driver facing sideways, looking out the side widows. Even though I never faced forward, my view of the front, the passenger side and the back was always quite clear. My home was off a very busy interstate highway, which would be our route for the gym this day. As was the norm, my dad and I were never at a loss for conversation, and that was the case this morning. Once on the highway, my Magoo and I chatted like chipmunks, and his normally slow pace was replaced with a heavy foot syndrome. In minutes we were cruising with the truckers. Halfway there, an uneasy feeling broke in on my lightheartedness, and I made an effort to push it aside. But, we were in the passing lane with an eighteen wheeler snug to our behind, and trying to pass us on the right was a pickup truck, the squeeze made me nervous. As I sat there, I noticed a motor home that pulled along side of the beasty truck, and behind the pickup. This added vehicle heightened my anxiety. We were traveling in a block of four at eighty miles an hour, and the tight fit really concerned Magoo and I. As my eyes shifted watching each vehicle, I saw a bit of smoke coming from the truck along side of us. We were traveling neck and neck at an even speed, when his tire blew, and his truck was headed straight into our passenger door. In that moment, we both shouted. With my eyes closed I envisioned the truck to the right plowing into our passenger side, with the eighteen wheeler crushing us from behind. As far as the motor home, I thought it would add its metal to our mangled pile. The moment seemed like minutes. But, when there was no crunch, I opened my eyes. The pickup was turned backwards in the grassy medium, the eighteen wheeler was nowhere in sight, and the motor home was pulled over about ten car lengths back. My dad was gripping the steering wheel so tightly, his knuckles were as white as his face. With a shaky voice I managed to ask. “What happened? What happened to the crash? Where is the eighteen wheeler? The state police were already assisting the fellow in the pickup, and my father just stared straight ahead and drove in shock. There was NO WAY the pickup could pass in front of us; its only way to the medium was to go through us. And, the eighteen wheeler destined to ride right into the back of us ~ gone! “Dad, did you see how it happened? Still in shock my dad rolled ahead, and did not stop until we pulled into the gym parking lot. We were both white as ghosts, and our hearts pounded so strongly, it just took our breath away. Again, with a cracking voice I asked. Dad, how…how did we not get crushed? He turned sideways in his seat and grabbed my hand. His palms still dripping wet, he said with tears in his eyes. In the gym we told the story over and over, and everyone had a theory. Time stood still. We went into a parallel universe. Maybe, we were lifted by angels. Jeff believed it was an UFO intervention. When we called out simultaneously ~”God help us!” ~ something transpired that bent the laws of the universe. God helped us, our three word prayer was answered. My father and I discussed this over and over, year after year. He has passed, but as I wrote this today, I felt his presence and heard his voice. My dad holding my shoulders as I workout my biceps.